Tess is a mixed media and collage artist. She mainly uses handmade paper in her work. She stitches into paper by hand and machine, using it to make marks or draw. She creates textures and adds layers with paint and recycled pieces of paper. She graduated from Cornwall College in 2006 and in 2009, had her own studio/workshop in St Ives, Cornwall, where she made, exhibited and sold her work. 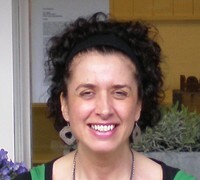 She now lives in Cambridge and sells her work at various art fairs and through independent boutiques and art galleries. She is currently exhibiting at the St Ives Society of Artists' Spring Open Exhibition and is working on a new range of work for Cambridge Open Studios in July, which she will be showing at the Cambridge Museum of Technology, The Old Pumping Station, Cheddars Lane, Cambridge.